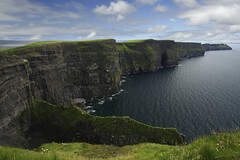 The Republic of Ireland consists of over 80% of the "Emerald Isle." This lush green island is full of thatched cottages, pubs, music, wit and poetry. The relaxed good humor of the people make Ireland a most welcoming place to visit and perform. Ireland has seen more than its share of wars and disasters, culminating in the Great Famine of 1845-8. Since then, emigration has been part of the Irish way of life. In fact, more people of Irish descent live in the United States than in Ireland itself! This is certainly one reason that so many American groups are interested in visiting this country. This is the homeland of literary giants such as James Joyce, George Bernard Shaw, Samuel Beckett, Jonathan Swift and Oscar Wilde. Music-wise, who has not heard the unmistakable lilt of an Irish tenor? Ireland is the only country in the world to have a musical instrument – the harp – as its national emblem. In this land, famous for its love of music, modern forms such as country & western and rock flourish, but it is the traditional music that captures the essence of the country. Whether you are listening to Gaelic love songs that date back to medieval times or 17th – and 18th-century folk songs with their English and Scottish influences, the music is unmistakably Irish. And dance is an equally important aspect of Irish culture. Come to the land of St. Patrick to see Neolithic sites, kiss the Blarney Stone, listen for banshees, look for leprechauns, hear Gaelic spoken, and most of all, perform in historic settings to warm, appreciative audiences. Wonderful musical experiences! Lovely scenery, interesting sight-seeing (in spite of the rain), excellent hotel accommodations, great meals and wonderful concerts. All in all, a very positive tour to Ireland. I thought that all performances were wonderful – lovely venues; enthusiastic, appreciative audiences; warm receptions, with metaphorical arms wide open; lovely, embracing people. I am happy to serve as a reference source for MCI. We have been very happy with our three international tours you have arranged. 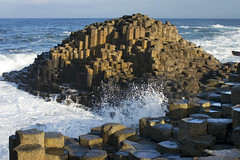 Our recent tour to Ireland and Scotland was a great success. This was our third tour with Music Celebrations. Our tour manager was the best we have ever had. Both he and the bus driver became part of our group and quickly became dear friends. 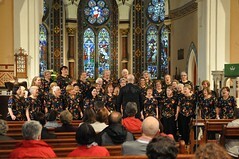 Our concerts were fantastic! The concert in Bray (south of Dublin) was a ball! This was definitely our performance highlight. Full house (300 people) and we developed a relationship with the audience that seldom happens. Thanks to all of you for your hard work. We were well taken care of. Your on-site staff was superb (can’t say enough nice things about our tour manager!) and my interaction with your office was great as always! This tour was what I have come to expect from MCI – EXCELLENCE!! Our two weeks in Ireland were filled with special experiences. We found the people to be tremendously receptive to us and our music and they very willing to go out of their way to assure us the very best of times. Music Celebrations International arranged terrific concert venues which were well publicized and well attended. The young people in the ensemble were able to meet and converse with many locals their own age. I can honestly say that our tour to Ireland was a wonderful experience in all respects; musically and culturally. It was just another example of how MCI takes special care in all their arrangements. I look forward to traveling there again in the very near future.